not exactly learning my lesson. gambling day 3. feeling sorry for myself and decided to go for a long walk. put on my “today is a bummer, but it will get better” mix (brendan benson- what i’m looking for, frou frou- let go, corrine bailey rae- put your records on, superbus- on the radio, liz phair- whip smart, and ai otsuka- sakurambo), and headed the mile across town to the west end 7-11 to buy myself a high value scratch ticket. as it turns out, the 7-11 is double sketchy at lunch time (don’t trust people who eat food kept warm by rollers), but that’s irrelevant. $5 is the most i’ve ever paid for one ticket, and it actually felt really bad handing over the cash. 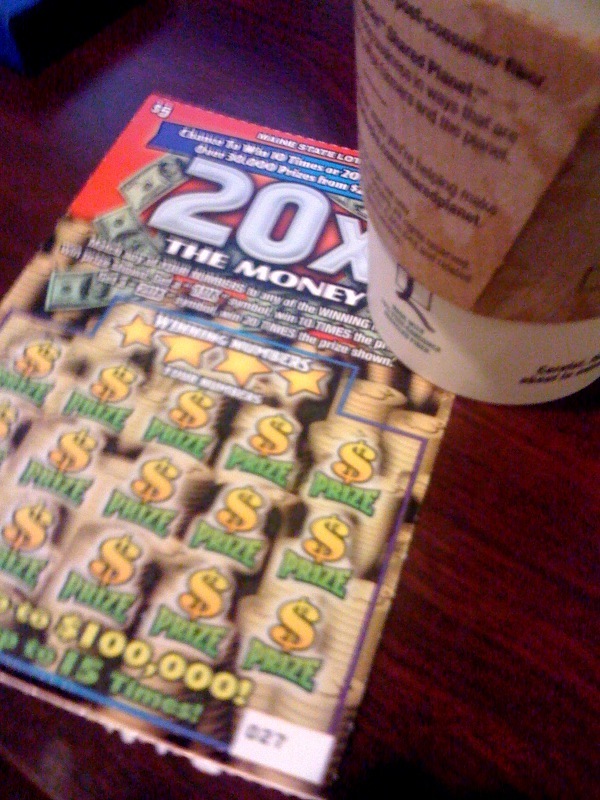 um, really bad until i got back to work and realized that i won $20! as of right now, i’ve spent $15 and won $22. $7 profit isn’t really helping me learn that gambling is for suckers. although it did make me feel better. Awesome!! R u gonna buy an actual ticket for the big pot? oh yes. i haven’t decided if i’m going to spend this week’s remaining $5 on powerball, or if i’ll do $20 or powerball & megabucks next week. i feel like i need to consult a psychic advisor or something! My next door neighbor won $21000.00 on a dollar scratch ticket last year. I never win more than the ticket costs, so I don’t buy them anymore. i buy one every now and again for fun, but i almost never win anything (never over $20). i thought i would be fun to use this experiment for a big blowout to see how much you can really win. my guess is not that much (but it sure will be fun to try!). Bess, will we be reading your posts about gamblers anonymous a year from now?